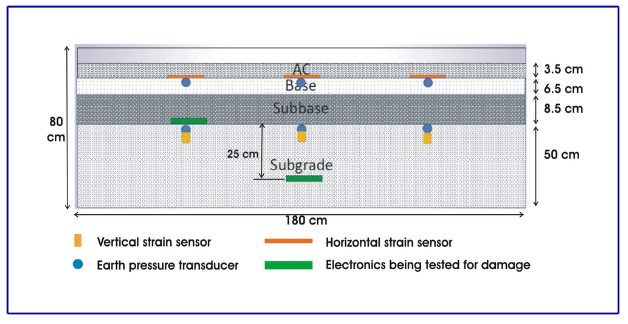 We have created several desktop prototypes, in order to confirm that electronic elements can be reliably detected under a simulated road or railway track. An array of electronic elements was installed below the "road", with some positions intentionally omitted. 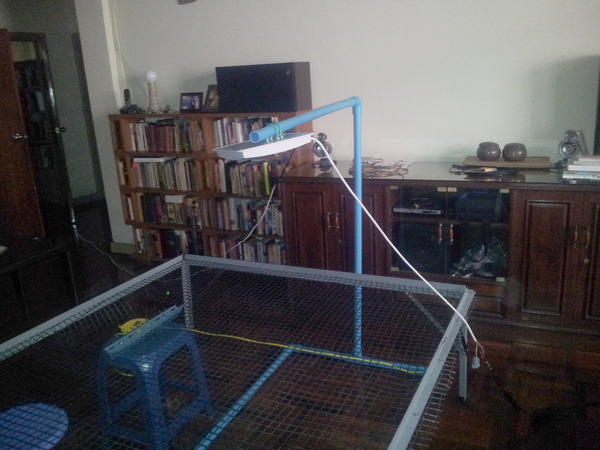 The sensor array was pushed along road by hand (prototype 1) or using a robotic cart (prototype 2). Results showed that locations with and without electronics were correctly identified. We also created some simple visualization software. 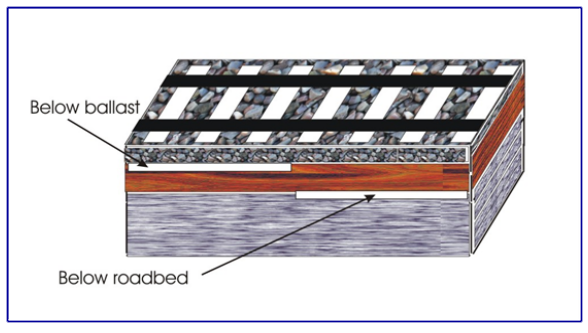 The screen in the image above shows the pattern of responses The blue circles show location of intact geosynthetic Brown circles show places where geosynthetic did not respond. Using Geogrid GX 40/40 †, a weight of 40 kg applied for 24 hours caused a stretch of about 5%. Additional time did not increase the stretch. Using Polyfelt TS20, the stretch was about 10% in 24 hours. † We gratefully acknowledge the assistance of Tencate Geosynthetics (Thailand) Co., Ltd., who provided us with test samples. 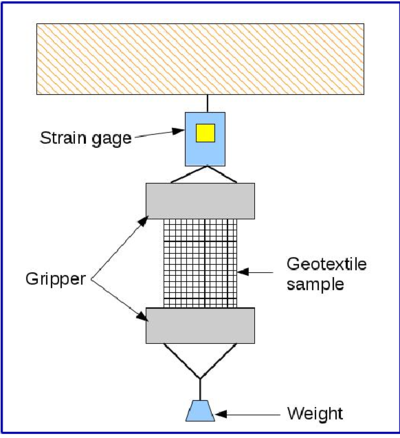 A weight of 38 kg above the unsupported geotextile/electronics was sufficient to stretch the geotextile and render the electronics inoperable. This condition was detected by the sensor suspended above. Eight samples of the electronics were buried within a road structure consisting of three 20-cm layers of sand topped with 7 cm of asphalt. Four of the electronic elements were buried under 20 cm of sand plus the asphalt. Four more were embedded under 40 cm of sand plus the asphalt. Electronics were reliably detected through the road materials. Samples of the electronics were buried within a road structure consisting of 65 cm of sand topped with asphalt, at 18.5 cm and 33.5 cm depths. 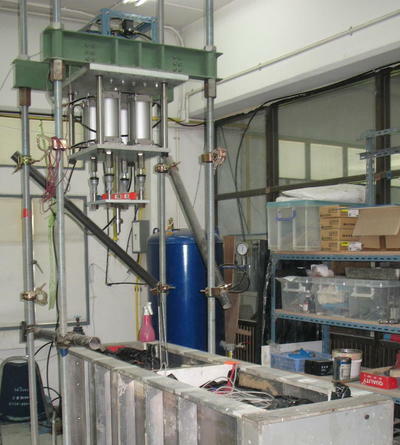 The samples were stressed by repeated force of about 6000 N. No electronics were damaged and all were detected from above. test the effect of varying sensor speed along surface.